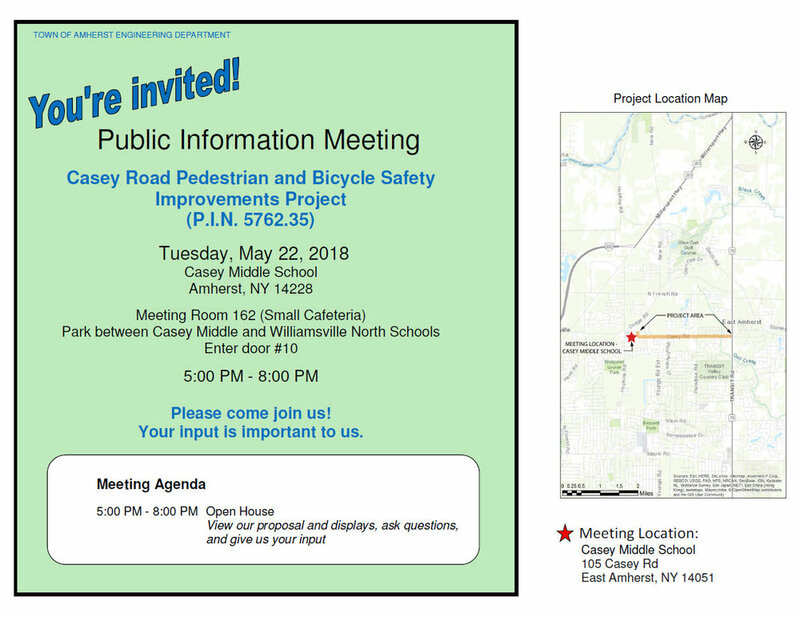 The Casey Road Pedestrian and Bicycle Safety Improvements project seeks to improve pedestrian and bicycle safety along a 1.73-mile portion of Casey Road, between Casey Road Middle School and Transit Road, in the Town of Amherst. The project proposes to add ADA compliant sidewalks, curb ramps, and crosswalks on the north side of Casey Road between Casey Middle School and Ashbury Court to complete a continuous sidewalk section. Pedestrians will be accommodated on the shoulder from Ashbury Court to Transit Road. It also includes addition of a widened shoulder, or a separate bike lane to accommodate bicyclists. Finally, the scope includes consideration of a shared use path from Casey Road into Paradise Park, terminating at the parking lot, and addition of a bicycle/pedestrian rest stop. The Project is a locally administered, federal aid project sponsored by the Town of Amherst Engineering Department. The Federal Highway Administration (FHWA), through the New York State Department of Transportation (NYSDOT), has made funding available through the Transportation Alternatives Program (TAP). What are the Proposed Improvements? Town of Amherst Engineering Dept.